2. If there is no polling, then the election margin in 2012 was between Obama +7% and Romney +13%. Criterion #2 is based on the fact that Clinton-v.-Trump is currently polling about 3 percentage points more Democratic than the Obama-v.-Romney vote in 2012. 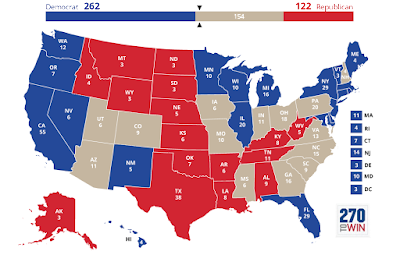 So a Romney +3% state would be right on the edge at this moment in time. * Sarah Posner gives us the rundown on how the religious right is reckoning (or not) with the presumptive Republican nominee. Trump has been bragging about his evangelical support since he began receiving favorable coverage, dating back to last summer, at the Christian Broadcasting Network — the media empire launched by Pat Robertson, whose Christian Coalition pioneered the evangelical get-out-the-vote strategy. But despite besting Ted Cruz among evangelical voters in several states, including in the Deep South, Trump faces a divided religious right. That means it will be harder for him to mobilize these otherwise reliable Republican voters in November. But it also means religious right leaders will have to clean up the detritus Trump has made of their movement. * Jonathan Cohn writes that: Hillary Clinton Is A Progressive Democrat, Despite What You May Have Heard. If Sanders is the standard by which you’re going to decide whether a politician is a progressive, then almost nobody from the Democratic Party would qualify. 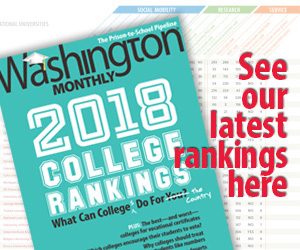 Take Sanders out of the equation, and suddenly Clinton looks an awful lot like a mainstream progressive — firmly on the left side of the American ideological spectrum and maybe on the left side of the Democratic Party’s, as well. One reason it’s easy to miss this is that Clinton’s domestic policy agenda doesn’t include one signature idea or position that’s going to dominate the headlines or get activists excited. Instead, it’s a series of proposals that, together, would fortify the social safety net, strengthen regulation of industry, and bolster public services. To the extent these programs require new spending, the money would largely come from new taxes on the wealthy. * Apparently Ted Cruz might want a “do-over” on that whole thing about dropping out of the race. “We launched this campaign intending to win. The reason we suspended our campaign was that with the Indiana loss, I felt there was no path to victory,” he said Tuesday on conservative host Glenn Beck’s radio program. * The White House announced today that Obama will be the first sitting president to visit Hiroshima. …on May 27, the President will visit the Hiroshima Peace Memorial Park, a site at the center of the city dedicated to the victims of the atomic bombing, where he will share his reflections on the significance of the site and the events that occurred there. He will not revisit the decision to use the atomic bomb at the end of World War II. Instead, he will offer a forward-looking vision focused on our shared future. In making this visit, the President will shine a spotlight on the tremendous and devastating human toll of war…. The President’s time in Hiroshima also will reaffirm America’s longstanding commitment – and the President’s personal commitment – to pursue the peace and security of a world without nuclear weapons. As the President has said, the United States has a special responsibility to continue to lead in pursuit of that objective as we are the only nation to have used a nuclear weapon. William took to Google Maps and projected that there must be another city hidden deep in the thick jungles of the Yucatan Peninsula in Mexico. 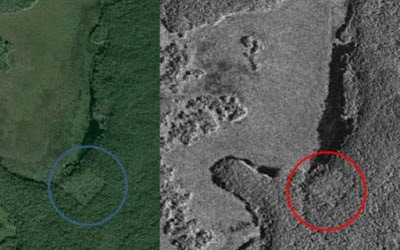 The Canadian Space Agency agreed to train its satellite telescopes on the spot and returned with striking pictures: what appears to be an ancient Mayan pyramid and dozens of smaller structures around it. If the satellite photographs are verified, the city would be among the largest Mayan population centers ever discovered. It fell to William to christen the new city and he chose the name K’aak Chi, meaning Fire Mouth, and the teenager said he hoped to one day see the ruins with his own eyes.